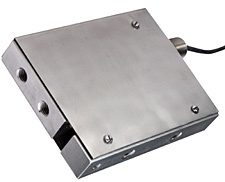 The LCAD Series Platform Load Cell is a hermetically sealed load cell. Applications include industrial food processing and weighing and automated weighing stations, where high accuracy and watertightness are important. The all-stainless-steel construction and rugged design give the LCAD high accuracy and high reliability even in washdown areas. The LCAD is also available in metric configurations, with 0-25 to 0-500 kgf ranges. Please see the LCMAD for complete details, or contact our Pressure department for more information..
참고: All LCAD load cells come with a NIST traceable calibration certificate with 59 kOhm shunt cal data.